The Crop Brush Textures option is used to crop an unnecessarily large texture bitmap that lies unseen beneath the vector contour of a textured line. This often occurs when you cut and paste textured lines from one drawing into another. If you cut a portion from a textured line and paste it into a different drawing, Harmony pastes the entire unseen texture bitmap from the source drawing into the new one, even if you only took a small portion of the source drawing. Using the Crop Brush Texture command will crop away extraneous texture that does not touch the vector area. If there are many textured lines in your scene, this will greatly reduce the file size. 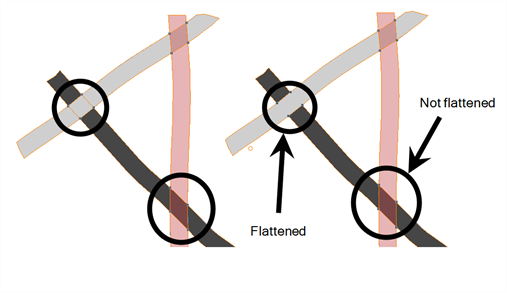 In the example shown above, a textured line is cut from a drawing and pasted into a new drawing. At first, it appears as if only a cropped section of the underlying texture bitmap was cut and pasted as well. 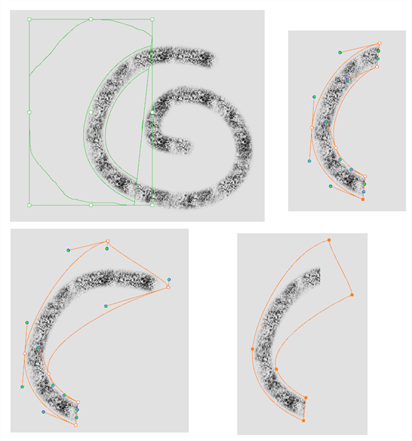 However, using the Contour Editor tool to expand the vector envelope of the textured line, it is revealed that more texture bitmap exists beyond the cropped boundary. If you use the Crop Brush Texture command, the bitmap texture is cropped to the boundaries of the textured line’s vector contour (as seen in the fourth image where the vector envelope has been pulled out to reveal empty space).